New Nissan Micra 2017 has finally made its world debut at the Paris Motor Show. One of the key highlights of the new Micra is its sporty design that is inspired from the Sway concept. The hatchback’s new model has been created to be a flagship. If reports are to be believed, the hatchback will go on sale in Europe by the end of this year or early next year. In fact, Nissan has already begun testing the car on European roads. Read More – Nissan Kicks Compact SUV Is Coming To India The 2017 Nissan Micra carries a more radical design, and looks a sportier than the outgoing model. 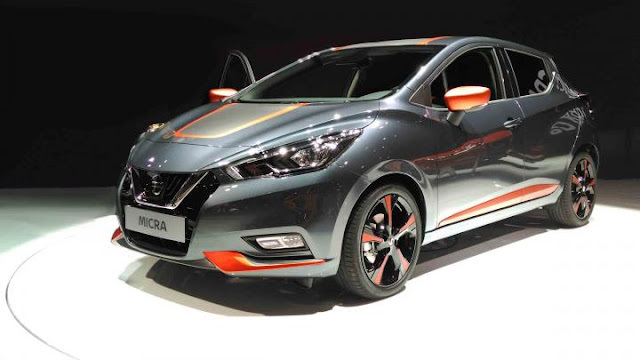 The new Micra is claimed to be longer, wider and lower than the current car. The car features a familiar V-shaped grille, sleek headlamps and angular air vents upfront. There are sharper creases on the sides that run across the length, giving it much needed sporty profile. Features like lower stance and sleeker roofline and sporty rear with stylish tail-lights and roof spoiler are heavily inspired from the Sway concept. The European-spec new Nissan Micra could be offered with a 0.9-litre TCe turbocharged petrol engine along with the existing range of petrol and diesel powertrains. For global markets, the hatchback will be made available with a range of petrol and diesel mills with capacity from 1.2-litre to 1.6-litre. Though, it is still to be known if these will come to India as well or not. Just like the current-gen model, the Micra’s new model could be brought with a 5-speed manual and a CVT gearbox New Nissan Micra 2017 India Exterior Unlike the European-spec model that is based on the new CMF-B platform, the India-bound Nissan Micra will continue to feature the existing V-platform. Design and styling of the new-gen model, however, will be heavily inspired from the Nissan Sway concept that was first unveiled in 2015 at the Geneva Motor Show. The car will carry stylish curves with compact and futuristic design.